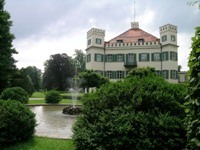 Starting from Munich, your professional English speaking driverguide will take you to lake Starnberg, where we will first undertake a walking tour through the gardens of Possenhofen castle. This is the place where empress Sissi of Austria spent her childhood and which she always remembered dearly. Unfortunately, it isn't possible to visit the interior of Possenhofen castle, but during our walk through its gardens your guide will tell you many interesting facts and anecdotes about the youth of the legendary empress Sissi. After having left Possenhofen, we will drive to Starnberg and board a lake cruise ship that will take us to Berg, the place where king Ludwig II of Bavaria (mad king Ludwig) found a tragical death in lake Starnberg. After the end of the sightseeing tour, your driverguide will take you back to Munich.